Description: It seemed in the 1970's that Playskool was getting the lead on Fisher-Price. After all, they were the ones who had tie-ins with Winnie the Pooh and Disney for their Weeble sets. Fisher-Price decided to remain competitive by snagging the Muppets, and outdid Playskool with the finely-built #938 Sesame Street that hit stores in 1975. Anyone familiar with the television show needs no introduction to what the base looks like, as it duplicates the actual brownstone building to a T. Obviously, Playskool themselves must had been impressed--after Fisher-Price put the #938 to rest, Playskool came up with their own copycap version, recalling the lacing shoe set that Playskool shamelessly cloned in the 1970's. Popularity notwithstanding, #938 ended production after only three years, though both the #937 Clubhouse and #939 Extras continued in production for one more year. B938A - 2-story apartment building with a grey plastic base and a brown roof. The apartment building has 2 sides (green & orange), and the building opens in half to access the inside of each building half. FPT782 - White 6-rung ladder (including top and base). Both end steps are flat. Rectangular TV with a Grover on litho. *See Variations below for colors. 2-seat sofa. *See Variations below for colors. Small rectangular coffee table. *See Variations below for colors. Round table with a litho of a pork chop platter and 2 plate settings. *See Variations below for colors. 2 each - Captains chairs (should match the table color) with triangles on the back. Click here to see the difference between triangles and no triangles. *See Variations below for colors. Single bed marked "B" on the headboard. *See Variations below for colors. Single bed marked "E" on the headboard. *See Variations below for colors. FPT929 - Brown round Big Bird bird nest with simulated twigs and sticks on the top and sides. The top center of the nest has a round Original Little People figure hole. Measures 3" diameter. FPT459 - Green 2-seat sanitation truck, has "Sesame Street Sanitation Dept." on the sides in white. Wheels are marked "FISHER-PRICE TOYS". FPT224 - Green antique style street light post with a round white "light" at the top and a sign on the side marked "Sesame Street" in white (on both sides). FPT240 - Short red fire hydrant on a gray trianglular sidewalk curb. FPT51 - Blue stand-up style street-corner mailbox WITH LITHO on front "mail". Has 4 "feet" on the bottom. FPT242 - Small grey rectangular plastic newstand with an upright display shelf on the back and a lithograph picture of newspapers and magazines on the countertop. FPT1032 - Grey rectangular plastic lunch counter unit that has a two place setting meal lithograph on top of the flat "counter". 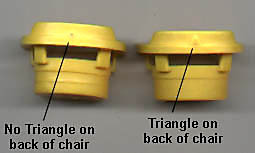 There is a flat rectangular area on one side of the counter for figures to stand, and two round blue seats on the other side of the counter for two Little People figures to sit. FPT1022 - Yellow rectangular hard plastic eraser with black foam on the bottom side. The top of the eraser is marked with a "FP" within circles imprint. The top of the eraser has a SMOOTH finish. *See "Variations" below. 8 Original Little People Sesame Street Figures. All figures have a plastic body and a plastic head: The trash can lid has a handle on top in 1975 and 1976. *See Variations below. LTPP - Oscar's trash can lid has a HANDLE on top in 1975 and early 1976. The lid had no handle after 1976. FPT8680 - Yellow (Gold/Butterscotch) rectangular TV with a Grover on litho. FPT22380 - Orange rectangular TV with a Grover on litho. FPT307 - Brown (light brown / rust) rectangular TV with a Grover on litho. FPT8456 - Yellow (Gold/Butterscotch) 2-seat "stuffed" sofa (couch). FPT8705 - Orange 2-seat "stuffed" sofa (couch). FPT180 - Brown 2-seat "stuffed" sofa (couch). FPT192 - Yellow (Gold/Butterscotch) small rectangular coffee/end table. FPT195 - Orange small rectangular coffee/end table. FPT363 - Brown (Rust / Light Brown) small rectangular coffee/end table. FPT191 - Brown (Medium Brown) small rectangular coffee/end table. FPT361 - Brown (Dark Brown) small rectangular coffee/end table. FPT203 - Round Yellow (Butterscotch/Gold) table with a 2-MEAL PORKCHOPS LITHO on the flat top surface. FPT206 - Round Orange table with a 2-MEAL PORKCHOPS LITHO on the flat top surface. FPT202 - Round Brown (Medium Brown) table with a 2-MEAL PORKCHOPS LITHO on the flat top surface. FPT144 - Small orange plastic single-seat captain chair that has TRIANGLE mark on back. FPT102 - Medium brown single bed. The headboard is marked with a white "B" (for Bert) within a circle. FPT8461 - Yellow (Gold/Butterscotch Yellow) single bed. The headboard is marked with a black "B" (for Bert) within a black circle. FPT103 - Medium brown single bed. The headboard is marked with a white "E" (for Ernie) within a circle. FPT8466 - Yellow (Gold/Butterscotch Yellow) single bed. The headboard is marked with a black "E" (for Ernie) within a black circle. This was the first ALL PLASTIC Play Family set made by Fisher-Price.